It’s Tennessee week. We have the 1972 game. 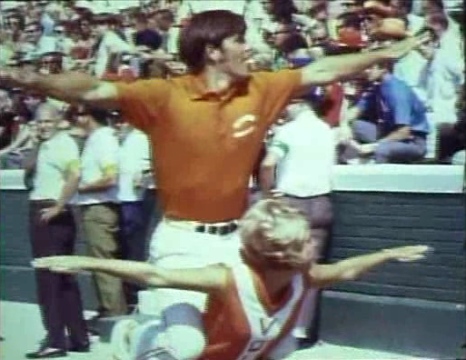 And the ’71 game. Here’s the 1970 version. We counted 29 turnovers (that’s when we stopped counting), one Sullivan to Beasley touchdown bomb, one safety, one Shug towel shake, and at least one gender role reversal on the Tennessee sideline. But gender issues were apparently on minds of everyone that day, not just the Volunteers. 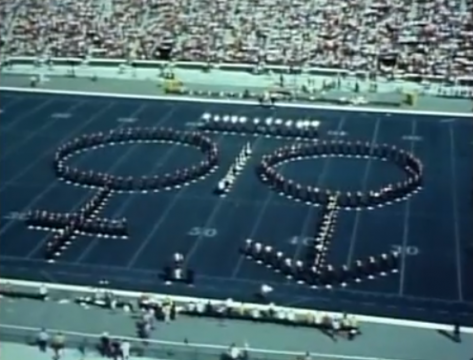 Here’s a still from the Auburn University Marching Band’s halftime show. Related: Auburn in 1971 SEC Promo Film. I was at this game, in Birmingham. As I recall Auburn got behind early and came back. I think that the late Ronnie Ross had a pretty good game as did Terry Beasley. That was one of the first Auburn games I attended. 7 years old. Sat in the upper deck. I remember Sullivan passing all over the field. It was hot too. Fans were passing out around me in the upper deck. The ambulance cart would come get them. Love those slow motion 2-yard gains. The Tenn. player at 31:40 looks like he is broken in half. Then a trainer & a player start to drag him off the field. Good times. I thought you were kidding about the turnovers. I think you undercounted. Lashlee’s head would explode. Here’s the Youtube video of the game. I was the sideline reporter for The Decatur Daily at this game. Took nice photo of Terry Beasley on the sidelines standing in front of a big standing fan getting cooled off. It was a very hot day, especially down on the artificial turf of Legion Field.